Halloween is right around the corner, so I thought it appropriate to share with you a scary and gloomy “story.” Ready? Hair-raising movies, ghosts, and the like may be frightening, but do you know what’s even scarier? Pervasive and persistent, toxic and health-disrupting ingredients. They have slowly found their way into not only your personal care, cleaning, household products, furniture, and more, but sometimes even your food and water! 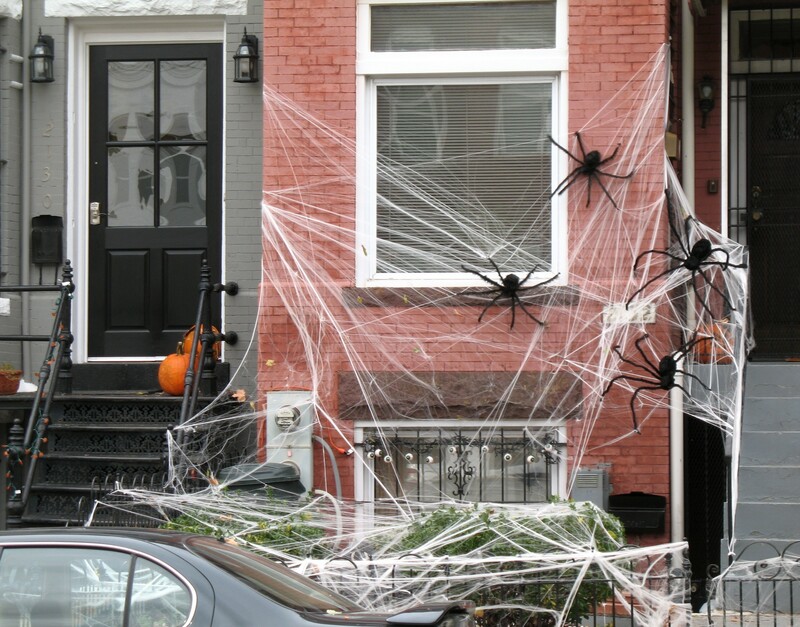 Creepy Halloween decor might send a chill up your spine, but harmful chemicals found in everything from your cosmetics to clothing to furniture, are by far more frightening. They cause dire health effects and negatively impact the environment. Photo © Túrelio (via Wikimedia-Commons), 2008 / Lizenz: Creative Commons CC-BY-SA-3.0-de, via Wikimedia Commons. You are surrounded and bombarded by them everyday. Worse yet, you may not even know you are encountering them. You innocently take them in by inhaling, touching, eating, and absorbing them through your skin. They become settled in your body. And your body can really only take so much — and eliminate so much. The ones that stay affect your health. Sometimes soon. Often times very slowly over time. And you may not even know it. Some are carcinogenic. Others mess with your hormones. Still others cause developmental effects. The list of health effects goes on and on. They get into the environment. They affect our water supplies. Our land. Our air. Living creatures. And some never break down. Ever. Others persist for years, but eventually go away. Some combine with other chemicals and give “life” to a new type of chemical — almost Frankenstein-like in nature — that further disrupts the environment and that we have a difficult time controlling. These chemicals affect us and the eco-system in so many negative ways, it’s scary what we already know and what we don’t. It’s even scary that we pretend everything is OK. In a very real way, they are haunting us. Terrifying, huh? Which chemicals are the most frightening? 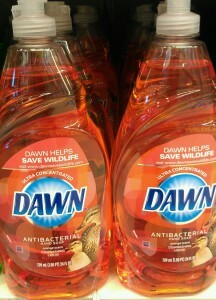 Triclosan is a harmful antibacterial agent found in Dawn dish detergent. It’s also added to an insane number of other consumer goods from cleaning products to clothing to carpet underlayments. Consumers, doctors, and scientists alike have serious concerns over its health and environmental effects, such as the fact that it increases allergen sensitization and pollutes streams. Photo © Karen Peltier and Well Gal, 2012-2014. There are several chemicals that could be mentioned. Probably hundreds. Most likely too many to list them all. But I have written about some of these creepy, harmful chemicals in a few previous posts. So let’s start there. Fragrance, glycol ethers (found in cosmetics, cleaning products, paint, and more), optical brighteners (found in eye make-up, paper, plastics, laundry detergents, etc. ), triclosan (a synthetic antibacterial found in toothpaste, bedding, toys, dish soap, sink mats, clothing, facial wash, and more), and volatile organic compounds (VOCs) (found in everything from cleaning chemicals to nail polish to paint) are definitely huge problems as I discuss in this post. These chemicals as a group affect almost every system in our body and are notorious for contaminating our environment. After reading about these chemicals, what you’ll notice is that there is a common theme — many of them are used across a wide array of industries. Photo courtesy of U.S. Air Force. Part of the public domain in Wikimedia Commons. Industries are eager to make products that consumers want, much to our own demise. For example, we subject ourselves to optical brighteners, just so that we can have really “white” laundry. But we can choose to not use them. We can buy organic and green products instead. In essence, we can vote with our money about what we will tolerate and what we will not. We can also educate ourselves about what is in the products we are buying by checking product reviews and databases and familiarizing ourselves with ingredient names. We can also get to know the companies we are buying from. Are they sustainable? Do they care about our health? The planet? Are they really green? Our government wants to protect us, but it is often slow to act sometimes. Laws and regulations are passed, but sometimes not until a lot of harm has been done. Questioning our government officials and pushing for change is something we need to do and not take for granted. Scientific studies are done to investigate the effects of certain chemicals, but they can take years. And only so many can be done. Also, no scientific study could possibly consider the toll these chemicals take synergistically. We are each individually affected in a different way. And we all select and use different products and live in our own unique environment. So we each encounter groups of different chemicals everyday. How could we possibly be so certain that the use of these chemicals is really safe when someone is telling us a certain percentage is OK? We need to trust our instincts, our intuition, and the information we do have at hand to make a safe choice for ourselves and our families. Do you know of any other good ones? If so, let me know by leaving a comment. I realize this was a “heavy” post compared to some of my others. I don’t mean to sound preachy or even too gloomy, but I am truly concerned about these chemicals and convinced they are affecting our health and that of future generations. What do you think? Are your concerned? Do you think something can and should be done about them? If so, what? Please share any other information or resources you think will shed light on the discussion. Copyright © Karen Peltier and Well Gal, 2012-2017. All rights reserved. Thank you so much for these resorces. I have been slowly transitioning to a place where I am using less harmful products in my daily life… but it truly is disturbing how much crap we are exposed to in a daily basis without our awareness of it. Karen, I agree about the dangers of all the chemicals we’re surrounded by. I think it’s disgusting that so much crap is put into our food, clothing, household items and personal care products . . . all for appearance and shelf-life. It’s unethical. It’s harmful. And most people don’t even think about it in order to change things. I buy organic, green items and products and much as possible. And I know there’s much more I could do. Have you thought about submitting this story to be published in a selection of short scary stories, like “Scary Stories to Tell in the Dark” or “The Scariest Stories You’ve Ever Heard”? What makes them especially scary is that they’re true. Zach recently posted…Keep the Engagement Ring in Nevada? Hi Zach. No, I haven’t, but thanks for the suggestion! Karen, Great article! I have been using all natural non-toxic green products to clean my home and in our yard for years and it has really made a big difference in how my family feels. I also only use organic green beauty products on my skin, hair, and nails and I eat organic foods and it has made me feel so much better. My blog is all about eating healing foods and tips for living a holistic lifestyle and I am so grateful you did this article so I can share it so everyone can learn how to avoid using toxic chemicals. As of recent i have learned a lot about chemicals and how bad so many daily used items are bad for us. It is quite scary what we have laying around the house. My wife and i went through and threw a bunch of stuff away (i would have donated but i cant have someone else exposed to this stuff knowlingly). We then went to a local store that sells natural products and stocked up. To be honest we feel much better and can tell a difference. My wife is a headache suffer and as of late they have decreased immensely. We think it is the products. This is the first time visiting your blog and I thought your post was very informative. I have to admit I never really looked at what chemicals we put into our bodies and the atmosphere around our lives. Reading this has opened my eyes to what I should be careful of when purchasing everyday products that we take for granted are safe but most are not. Thankyou for opening my eyes and awareness and will definately be reading labels from now on. 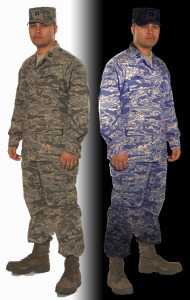 I still am concerned about it being a bit harmful, but that is also why they encourage service men and women to wear a shirt and shorts or some type of layer underneath the BDUs. I did not know of the danger as much since I have been steering away for almost all what it is “normally” used by most people… and it has been since 1998 when I start to pay attention to what was good for me and automatically eliminated many products.. but as I said above I am guilty for not looking any closer to eliminate even more..
Perhaps after reading your article is best to pay more attention. Thanks so much for doing what you do to help others. In Elizabethan times, some butchers probably steeped their meat in water to add weight. But I guess the roots of this modern madness can be traced back to the triumph of science in managing our world. Now that same mentality has become institutionalised and even enshrined in law. It’s a terrible indictment of modern societies that we need to view products with such suspicion. Living out in the country in sparsely populated northern Alberta, we aren’t affected by quite a few of the things you mentioned. But it doesn’t matter where one lives, or how green we go, we’re still surrounded by a huge array of products and food chemicals that are next to impossible to avoid. Thank you for the eye-opener! These chemicals are everywhere as you point out, Karen. One of the ones I try to avoid is fragrances. I have an immediate allergic reaction to most of them. It’s actually a good think to react allergically because then you are aware of the hazard and take steps to avoid it. The bigger problem is with “sub-clinical” levels of intolerance. They go undetected and we therefore are more likely to expose ourselves to these substances. That’s why it’s good that you are educating us things we need to be wary of, even if we don’t notice any adverse reaction to it. I fully agree with you here and people would not believe the amount of harsh chemicals they touch every day. That is the reason why I recently enrolled in a new business because they have all natural, eco-friendly products to both consume and use to clean houses, do laundry, etc. It is definitely the way to go! People should try to be more health and environmentally conscious, so keep spreading the word 🙂 Thank you for sharing! The worst I find is that, by extensive lobbying, many chemical companies manage to have their products written into “mandatory standards”. Every public place in the western world, restaurants, hotels, nightclubs, some shops, etc., have to be extensively treated with fire retardants. So you want to build a “healthy” timber home? Your framing is probably treated with anti-fungal and termite-protection chemicals, all according to building code, even though in a well built house that’s hardly ever needed. Your dry sheet internal lining is partly made from industrial waste. And so on! That’s a very good point! Lobbyists definitely influence our public officials with what is considered good practice, resulting in laws passed to “protect” us. Once they’re part of our building codes, we’re essentially forced to put these chemical-laden products in our homes and building structures. Not a very comforting thought, is it? I appreciate you bringing up the fire retardant, anti-fungal, and anti-termite treatment examples. Too many of us just don’t consider how many of the building products used in our homes and commercial buildings are full of these chemicals. By the way, I had no idea that dry wall lining is party made from industrial waste. Yikes! Scary isn’t it. These chemicals sound more dangerous than the dirt we use them on. It could be many years before the true harm of some of these is reflected in disease and illness. I recently stopped using an antibacterial spray cleaner. I’d used it for a while but only on small areas in short bursts. I decided to attack the whole bathroom with it and came out sneezing and coughing with itchy eyes and tickly throat. I’ve swapped it for something less potent and more natural. Yes, definitely scary! You bring up a very good and important point about how it could take years before we know the true effect these chemicals have. Glad to hear you stopped using the antibacterial cleanser. Sneezing and coughing is a sure sign to stop using a product. I’ve had similar experiences myself, sometimes even with “green” cleaners that truly aren’t that eco-friendly. In my humble opinion, many of the heavy-duty cleaning products out there might be useful in certain situations in public settings, but for at home use, we are just fine with natural-based cleaners like vinegar, baking soda, etc. 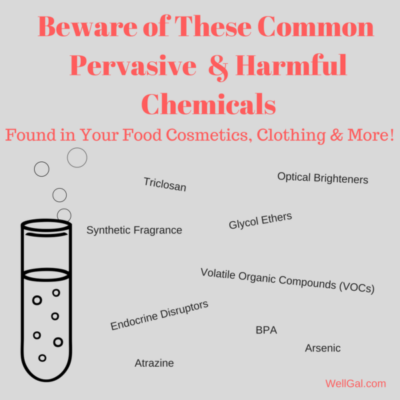 Well Gal recently posted…A Frightful Tale: Pervasive & Harmful Chemicals in Cosmetics, Home Products, Food, & More! This is serious. I am so aware of the food that I eat, carefully buying only organic produce which is always more expensive. And then I ignore the chemicals right in front of me in the kitchen and bathroom. Thanks for this important reminder to also choose organic cleaning products. This is creepier than Halloween ghosts and goblins! I like to go green as much as possible. I’m a label reader and when it comes to household chemicals I do the research most of the time. I have two dogs and only use white vinegar and water or my steamer to clean my floor, which has to be cleaned all the time with those little guys. Using anything else can put them at risk. As for cleaners…there are tons of great green ones we can use. Because I’m pretty aware of these things I do appreciate this article. The word needs to be spread out. I can rant about this all day long, but I’ll stop here lol. Thank you and I will share this with my friends. Ah yes, we definitely can’t forget about our pets! As they are so close to the ground, they are the ones surely to come into contact with not only dust, but the chemicals we put on our floors and carpets and even spray outdoors on our our lawns.